A dashcam captured footage of what could have been a disastrous collision on a highway in Laval. The video was posted to the Spotted: Dash Cam Québec Facebook page on Wednesday and has since garnered over 230K views. 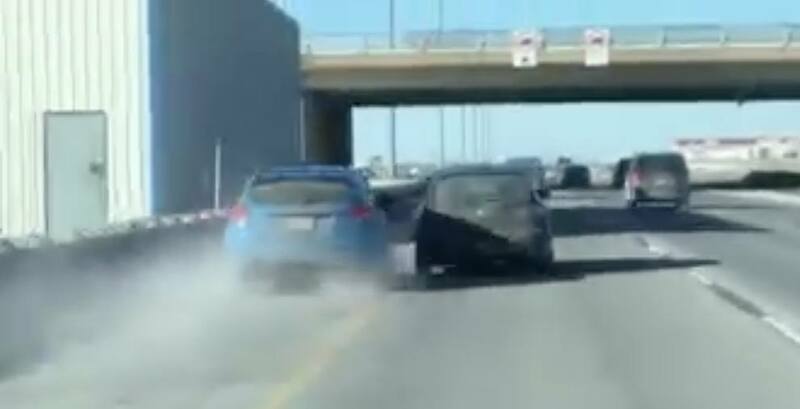 In the video, the lagging blue Ford attempts to pass a black car by using the leftmost shoulder of Highway 13 in Laval. As the Ford tries to illegally overtake the leader, the black car can be seen swerving onto the shoulder in an apparent attempt to cut off the trailing car. After avoiding the potential accident, the two cars continue onwards. Daily Hive reached out to Laval Police who have yet to comment on the footage.